Please submit a request for quote if you do not find your specific size in our listings. Cut metric and standard size washers! Click here for a full listing of what we have to offer. Thank you for visiting WashersUSA.com. We are a full service metal stamping company who stocks over 300,000 tooling sizes of standard and metric washers. These washers/shims can be ordered and/or quoted over the internet. 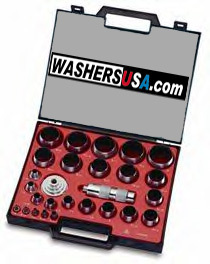 Just click here and fill out an ONLINE QUOTE FORM to inquire on any washer/shim washer. Additionally, we have access to numerous materials for your washers. Since we manufacture washers, a customer can mix and match any OD/ID and thickness for whatever material. Please visit WASHER SPECIFICATIONS, SHIM WASHERS and GAUGE TOLERANCE CHARTS for very helpful information in ordering/inquiring washers. nylon washers, aluminum washers, brass washers, copper washers, custom washers, fiber washers, flat washers, metal washers, plastic spacers, plastic washers, rubber washers, special washers, metric washers, stainless steel washers, stand offs, standard washers, steel washers, etc!! Use the ONLINE QUOTE FORM for pricing. CUT-TO-LENGTH bands as those used in electric motors. Please visit PRECISION STAMPINGS for details.